This paper has been submitted to R. Diederichs for the NDT online journal, www.NDT.net together with a downloadable software package Ermolov SolutionsTM that solves most of the equations presented by Dr. I. N. Ermolov in his 1972 paper. Use of the software and worked examples are provided in the software section identified under the tab "Notes". The authors hope to provide future works to develop further comparisons between actual scan results and results calculated by these equations. Sizing of flaws detected by traditional NDT methods has been proven problematic. Sizing by ultrasonic methods has been no exception; however, attempts are still being made to improve the tolerances associated with the techniques commonly used to size flaws. Transit-time methods using both forward scatter (TOFD) and backscatter (various tip diffraction methods) are probably the most accurate, but even these methods must have considerable tolerances placed on the estimates they provide. In spite of many studies and round-robin trials demonstrating otherwise, amplitude based methods are still being used with the idea that they can provide "accurate" results on real flaws. It was recently pointed out to the writer that the idea of relating amplitude to target size was well studied about 3 decades ago. In 1972 Dr. I.N. Ermolov published a summary of his earlier works["The reflection of ultrasonic waves from targets of simple geometry", Nondestructive Testing 5 (1972), pp 87-91] (previously published in Russian in Defektoskopiya). This paper by Ermolov expanded on the previous work done by Krautkramer [Fehlergrössenermittlung mit Ultraschall. Krautkrämer,J., Arch.f.d. Eisenhuttenwesen 30 (1959), pp 693-703] that was the foundation for the AVG (DGS) system. This paper will review the equations derived by Ermolov and will use scanned examples to illustrate the reasonable accuracy of the equations and limitation on selected ideal targets. Based on the significant contributions of Ermolov, this paper introduces no new concepts. However, with the recent efforts to revive the use of amplitude sizing of flaws, it was felt that a review of work done 30 years ago might help the understanding of the limitations of this concept. Dr. Ermolov used the same sort of assumptions as Krautkramer to derive relative amplitudes from ideal reflectors. He noted that the significant parameters affecting amplitude response were; size, distance and wavelength. In his analysis, Ermolov grouped target types into three classes and considered two general beam regions. Although the beam regions generalise as less than or greater than the near zone, Ermolov limits the far zone equations to be suitable for distances greater than 3N (i.e. 3 near field distances). His laboratory data shows some scatter and modifiers of up to a factor of 4 are inserted in the equations relating to the targets in the near fields. A further assumption made using the Ermolov equations is that the probes are monochromatic, flat (unfocused) and round (although there is a provision in the original paper to use a rectangular probe for some target calculations these are not used in this discussion). For practical purposes in manual scanning, the effect of signal maximising implies that the flaw is centred on the beam axis. Beam intensity will decrease as the ratio of the distance from the beam axis to the probe radius increases, but this effect is not calculated in the equations. A further factor not considered in the Ermolov equations is the D/l effect on the asymmetry that results for angle beams as D/l approaches unity[Wüstenberg, H., Characteristical sound field data of angle probes. Possibilities for their theoretical and experimental determination. Paper H03, 7th International Conference NonDestructive Testing, Warsaw, 1973 ]. The table below summarises most of the equations derived by Ermolov in his 1972 paper. Ermolov's calculation for the flat defect with area A is used with a flat disc reflector so we would need to calculate A from A=pr2 where r is the radius of the flat disc reflector (flat bottom hole). Brackets around the coefficients in the Near Zone equations indicate a range of possible values indicating a high degree of uncertainty. In both cases (Near and Far field) the amplitude is an exponential decay of the form e-2Td. Form factors described in the 1972 paper are not included in the table nor are the 2 equations for the rectangular probes (these applied to the near zone only for the infinite strip and infinite cylinder conditions). For the focusing cylindrical surface (an infinite plane) the radius of the reflecting surface is assumed to be the same as the distance along the beam axis to the target. With the advantages of modern computerisation it would be very convenient to simply have a computer algorithm process amplitude and length data collected to present the user with a vertical and lateral extent. But flaws are not so predictable as ideal targets. In Figure 1 we see a real welding flaw. It is seen to have a flat face (left side), a rounded or curved face (top) and an irregular face (bottom and right). To assign this flaw to one of the finite or infinite dimension classes is optimistic and we would obviously get different estimates depending on which direction we approached it and which class we assigned it. We can speculate the amplitude differences the flaw in the macro might provide. Using Ermolov's equations with a 5MHz 12.5mm diameter probe we will use the infinite strip conditions to simulate the 2mm high nonfusion seen in the macro. At the near field (1N) the relative amplitude we might expect would be about 14dB (relative to a flat infinite plane at the probe face). 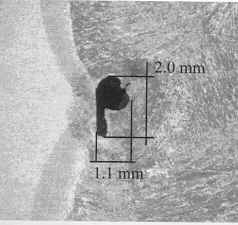 However, if this flaw gradually transitions to a 2mm diameter cylindrical pore/slag inclusion, as indicated by its shape just inside the nonfusion portion of the flaw, the relative amplitude would decrease to 25dB. Although the dimension of the flaw remains the same, its amplitude has dropped 11dB. For lower frequency probes the differences are less and for higher frequencies the differences increase. Variables such as orientation to the beam, acoustic impedance of the reflecting material, surface roughness and others as discussed earlier [Amplitude Sizing and Mechanised Ultrasonic Inspection Using Linear Scanning, E.A. Ginzel, January 2000 (http://www.ndt.net)] all add to amplitude variations. A simple series of scans was made using a small 3mm diameter nominal 15MHz transducer. Side Drilled Holes (SDH) and Flat Bottom Holes (FBH) were used as targets and the amplitude responses compared at varying sound paths. Comparing one against the other, results are not close to the predicted values. E.g. a 16dB difference is predicted between the FBH at 5.2N and the SDH at 5.3N but the value obtained was only 5dB. Similarly, the 4mm diameter SDH compared to the 0.5mm diameter FBH is predicted to give a 10dB difference but for this experiment the value was about 4dB. Much better comparisons are had when using the same class of target. E.g. plotting the amplitude drops over a series of diameter differences at different sound paths we see SDHs fall within 2dB of that predicted (and at sound paths greater than 3.2N the variation is less than 1dB). See Figure 2. In Figure 2 the Ermolov predicted values are shown with tolerance bars of +/- 1dB. For a similar comparison of responses on FBHs we see slightly more variation (Figure 3). Here the large differences predicted between 0.5 to 1mm and 1mm to 2mm diameter FBHs is not seen in the scan results using real conditions (over sizing would result if a 2 or 3mm diameter FBH was used to estimate a smaller diameter by amplitude response). Figure 3 suggests that beyond 3N the comparison to predicted dB differences are generally close (within 3dB of predicted values) for targets greater than 1mm diameter (tolerance bars on the Ermolov predicted values are +/-2dB). In both Figures 2 & 3 the relative amplitude changes are calculated with respect to the next adjacent target size. E.g. in Figure 3 there are 6 values plotted for the 1mm diameter FBH. These values compare the amplitude of the 1mm diameter FBH to the 0.5mm diameter FBH for the probe tested at the 5 soundpaths noted in the legend and these are compared to the values predicted by the applicable Ermolov equation. Similarly, the dB value indicated for the 3mm hole compares the 3mm to the 2mm FBH, the dB value indicated for the 4mm hole compares the 4mm to the 3mm FBH and so on. Figure 4 is a screen presentation using the software programme to compare expected responses from the various diameter flat bottom holes at 5.2N (equivalent to 117mm in water for the compression mode). The dB drop values were used to calculated the ideal amplitude differences in the graphs. Figure 5 indicates a C-scan and the relative responses from the flat bottom holes scanned at 28.8mm water path to the plate plus 9.8mm steel path in the plate to the surface of the FBH. This is roughly 2.5N yet the amplitude of the 5mm diameter FBH is slightly greater than the 6mm diameter FBH. The beam size for this probe is quite small (on the order of 1.2mm diameter at this distance) so a large diameter target with respect to the beam size may be evident here. The trace above the C-scan indicates maximum amplitudes for the position through the middle of each target. Amplitude of flaw signals is still an important factor and must not totally be ignored. A flaw must have sufficient amplitude for the operator to take notice of it and investigate its characteristics. This is even true for sizing using transit-time methods. Amplitude therefore provides the detection level. The model is based on total reflection of plane wavefronts of monofrequent waves. If mode conversion occurs the equations may be erroneous. The transverse wave angle therefore must be in the range between the two critical angles, i.e. in steel not below 35° and not above 75°. The assumptions hold only in the far field, i.e. at normalized distances above 5 near field lengths. At 3 N the error is acceptable (approx. 3 dB). Schlengermann further cautions that to use the equations; "an inspection should use the same class of artificial reflectors for calibration and evaluation (equivalent reflector size), and not rely on transfer calculations from one reflector class to another". These, and others, are sources of inaccuracies in amplitude sizing even when the flaw type is known. But some of these problems are also limitations for transit-time methods. Even TOFD can be stymied by multiple aligned flaws when all fall within the beam envelope just as poor orientation or small size can reduce ability to resolve a top and bottom TOFD signal. With so many variables, sizing by amplitude will continue to be imprecise and unreliable, therefore reasonable sizing tolerances should be allowed. It follows that statistical analysis of sizing by relating size estimates to amplitudes has little validity since more than a single dimension accounts for the signal amplitude and parameters other than the dimensions of the flaw are essentially unknowns. It follows that attempts to portray "Probability of Sizing Correctly" in the form of curves equivalent to "Probability of Detection" are misleading. We would like to thank O. Forli for bringing our attention to the 1972 Ermolov paper. Also, we would like to thank U. Schlengermann for his thoughtful advise and for relating his earlier experiences with these equations. Finally and most significantly we would like to thank Dr. I. N. Ermolov for his comments and for providing us with further background information on the subject matter.